Looking for small space living room ideas? Decorating Editor Anne Turner Carroll shares decorating tricks and tips she used in her own small space makeover. Turner had to grapple with a space where those things were nearly impossible to achieve. The first challenge: The den serves as a pass-through. Second: With doorways on two walls and windows and a French door on a third, there isn’t much wallspace for furniture. The room also isn’t perfectly rectangular; a large fireplace built diagonally into the space hogs most of the fourth wall. Ottoman: Dorian Octagonal Ottoman (M1011) by Martha Stewart Furniture for Bernhardt; bernhardt.com or 888-562-7842 for stores. Fabric on ottoman: Oxus Greige (2303-8) by Carleton V (carletonvltd.com), also available through DCOTA Design Services. Anne Turner paired a tapered floor lamp with a reupholstered vintage chair to create a secondary reading spot. Next to the chair, a cherished antique Empire-style chest from Neal’s family serves as an ideal TV stand and storage compartment beside the fireplace. 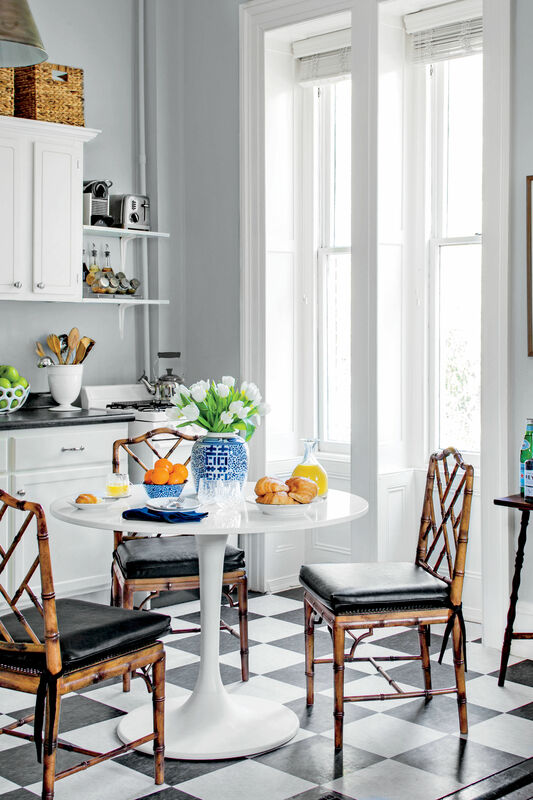 Side chair: For a similar look, try the French Colonial Rattan Armchair from Wisteria; wisteria.com or 800-320-9757. Fabric on chair: Sailcloth Shell (32000-0000) by Sunbrella (sunbrella. com), available through Calico Corners; calicocorners.com or 800-213-6366. Floor lamp: Dillard Brown Nickel Floor Lamp by Arteriors Home; arteriorshome.com or 877-488-8866 for stores. Originally, Anne Turner had an étagère in mind for the area located to the right of the doorway behind the club chairs. When she couldn’t find one that fit her budget, she went with floating shelves instead. She then filled the custom shelf arrangement with new finds and family mementos, such as her grandfather’s bookends. To balance the shelves, she added a large mirror to the left of the doorway to give the small room more depth. Shelves: Modern Shelf in Antique White from Pottery Barn; potterybarn.com or 888-779-5176. Because there was no room for a sofa, Anne Turner added a pair of club chairs upholstered in easy-care outdoor fabric at one end of the room, both facing the fireplace wall. A set of small nesting tables between the chairs provides space for a reading lamp, magazines, and other necessities. Club chairs: Dylan Chair (B4862) by Bernhardt; bernhardt.com or 877-442-4321 for stores. Side table: For a similar look, try Modern Glamour Nesting Tables from Ethan Allen; ethanallen.com or 888-324-3571. Table lamp: For a similar look, try Robert Abbey Edgar Glazed Ceramic Lily White Table Lamp from Lamps Plus; lampsplus.com or 800-782-1967. The den’s parquet flooring had also worn out its welcome. Because replacing it wasn’t in their budget, they reached for their rollers and painted it instead. For the walls and ceiling, the couple relied on a unifying paint job to make the room feel less confining. A soft, khaki paint color on the trim adds pleasing contrast. She placed her most cherished photos, such as her wedding pictures, in store-bought frames of various sizes and hung the frames in three vertical rows: only vertical shots on the outer rows, and a mix of horizontal and vertical shots in the middle. She then tucked loose snapshots between the frames with clear, sticky photo corners. Picture frames: Wood Gallery Single Opening Frames, from Pottery Barn; potterybarn.com or 888-779-5176.